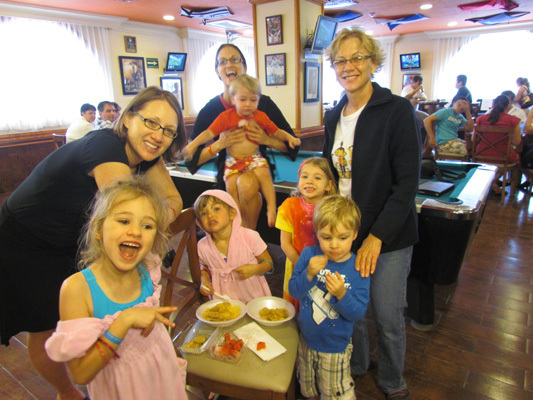 February was filled with fiestas, fundraisers, friendship and family. 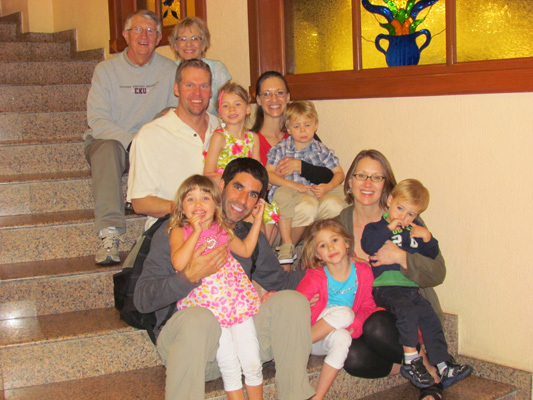 Here we are on the grand stairwell of an all-inclusive resort in Puerto Vallarta, Mexico with daughters, son-in-laws and five beautiful grandchildren, now 6, 5, 4, 3, and 2. We played hard for an entire week making this the highlight of February. Friends Chuck and Jean, had a life-long friend come to Ajijic. 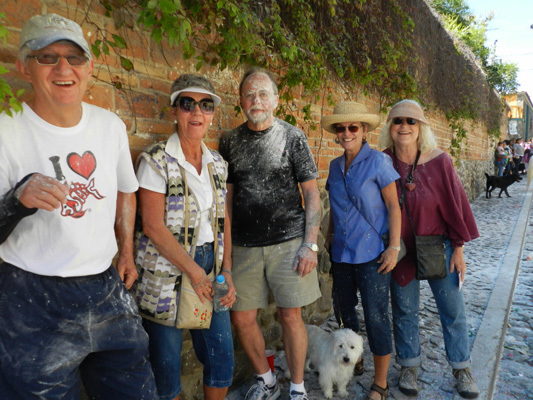 Lee, from Santa Rosa, CA spent time seeing the magic of Ajijic and a week of sighting seeing in Oaxaca. 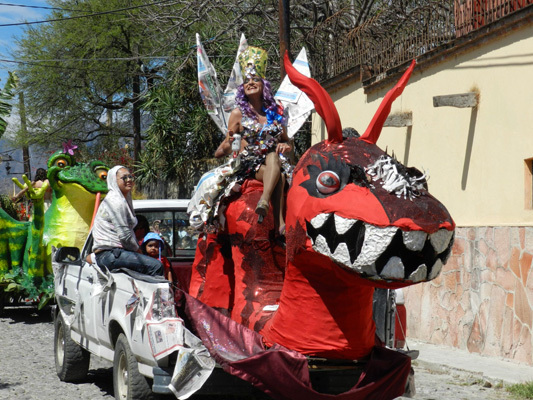 Oaxaca, a city and state that is in the heart of a number of important and well-known archeological sites in southern Mexico. So why are these friends of ours so transfixed? 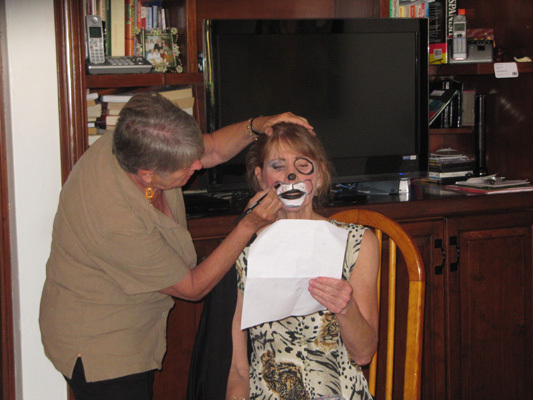 They are learning how to apply makeup for an upcoming fundraiser where several of our friends performed in four nights of Lip Syncing. 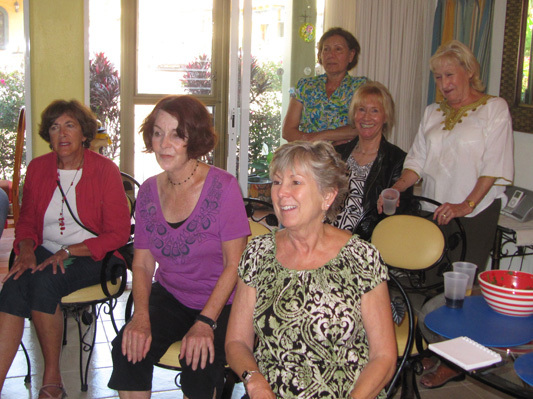 We were in PV when they performed and heard it was fabulous. This is the beginning of seven glorious days with our family. Denise arrived on a Sunday, we drove over on Tuesday and Carmen's family arrived on Wednesday. 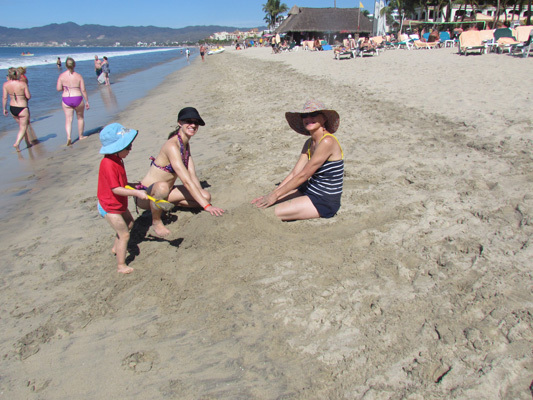 The grandkids proceed to bury Grandma Glorine in the sand along the Pacific Ocean. 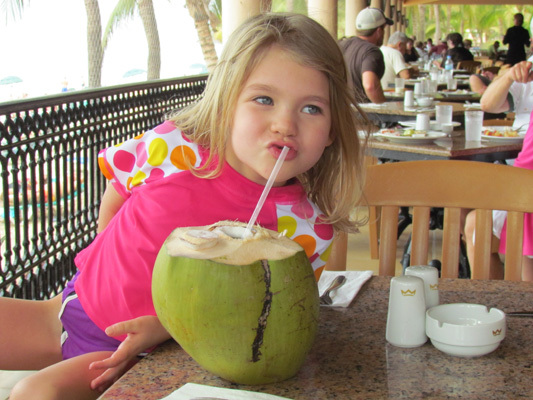 Here Clara is sampling a local custom--coconut milk directly from the coconut. hmmmmmmmmmmm! 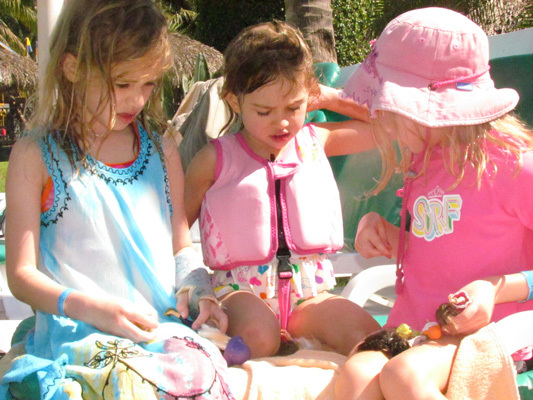 The resort is very kid friendly, with staff dedicated to keeping them occupied with fun activities. 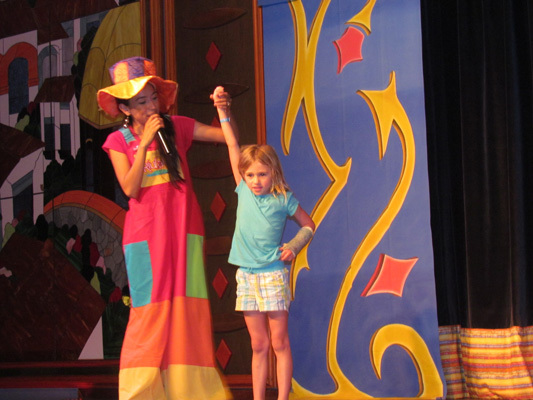 In the seven nights we were there, they had three amazing "Vegas-like shows." 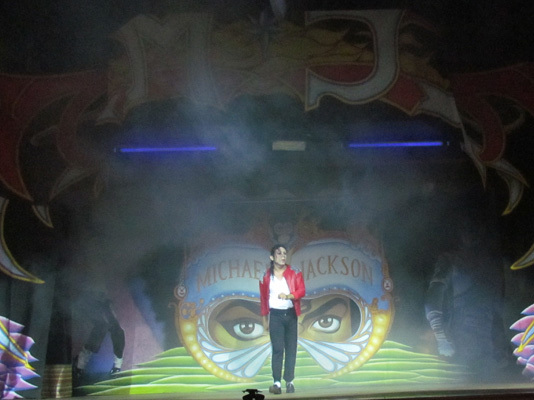 Here is a Michael Jackson impersonator. Unbelievable amount of dancing to some of his greatest hits. 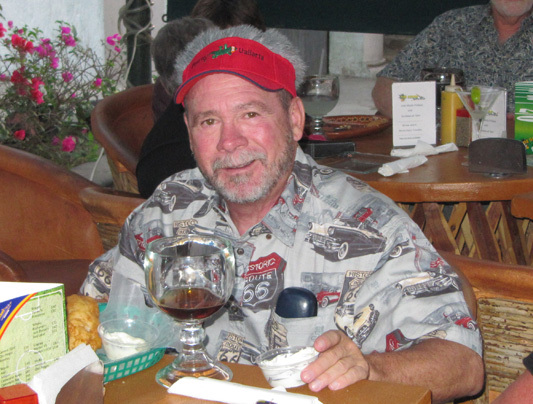 Here is Larry as we celebrated his January birthday. 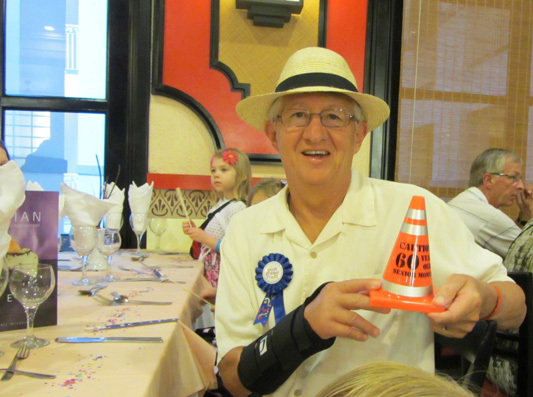 The kids were kind enough to get him this caution cone warning of possible senior moments. Glorine has a birthday coming up in March, so the Champaign bottles were flowing to mark our special occasions. 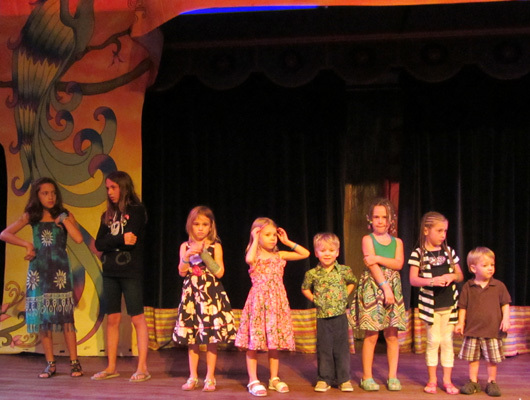 Each evening, the resort invited all the kids up to the stage to dance and play games. 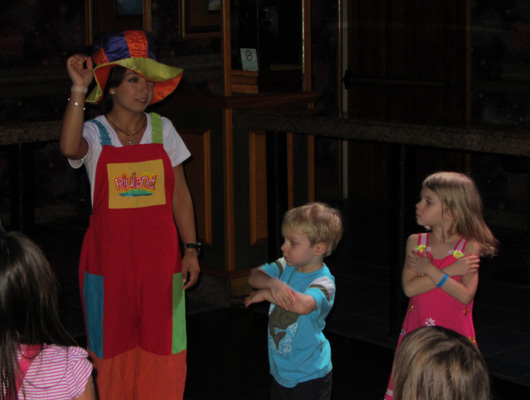 Here we captured Dakota, Clara, and Chase (middle) and Hunter on the end getting ready for some dancing. Here the girls are playing dolls. 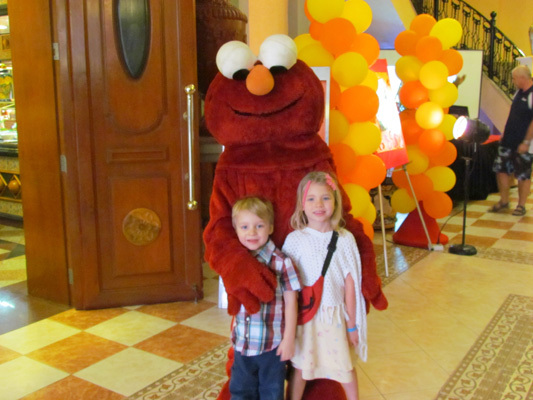 Elmo is greeting Chase and Clara at the door of one of four restaurants at the resort. Mike and the kids are poising in front of a fountains. 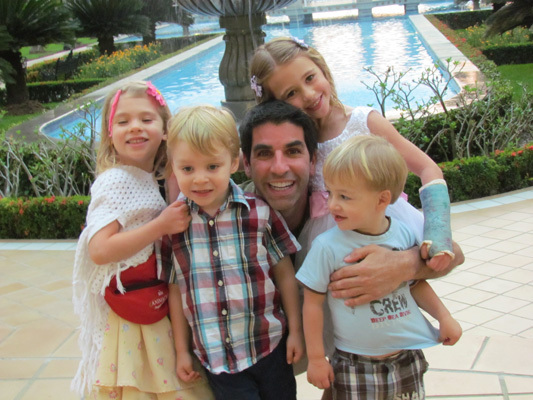 Note, Larry is not the only one with a broken arm. Dakota fell off the monkey bars at home and got a buckle fracture and expecting the cast to come off when they get back from PV. Here the Minnesotans are poising before another fabulous meal. 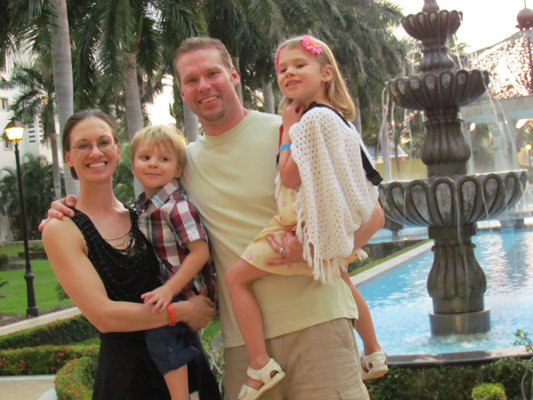 This is their third trip to PV over the past couple of years and love all the summer time activities the resort has to offer. And the special occasion is Hunter's birthday. 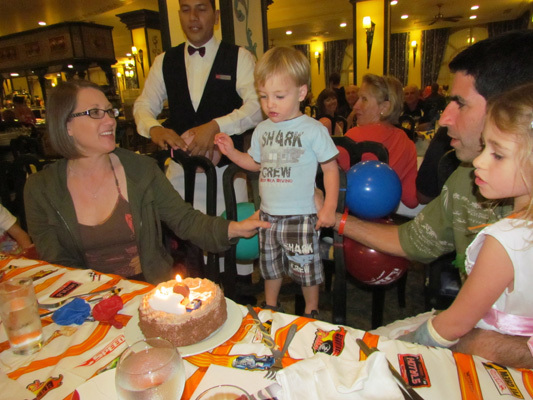 Our baby grandchild turned two and another reason to have a family get together. The staff got a special table prepared for Hunter to celebrate his birthday--including the cake. Wonder what he is wishing for? 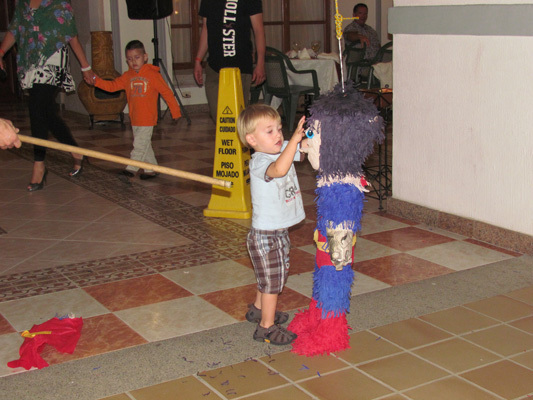 We brought this Pinata over from Ajijic. It was meant for Larry for his heroic deeds, but it was the hit in PV. Not only did our kids hit it, but lots of other kids got in line thinking it was a part of the resorts activities. Here Hunter is ignoring the stick and just trying to pick it apart. The activities were not limited to kids. Craig introduced Larry to the shooting range. 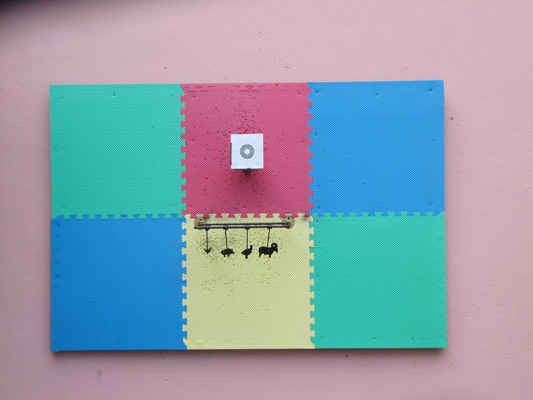 Each person got two shots at the target and two shots at the farm animals--each having point values depending on the size. Larry won the shooting contest this day by shooting the chicken--twice!! Somehow he racked up 500 plus points and was declared the winner. While the sun shines on most days, on this one it was raining. 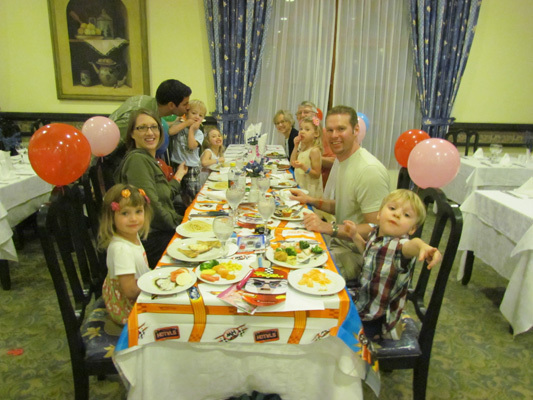 But the resort had enough indoor activities to keep us and the grandkids entertained. Another evening--another night of entertainment. 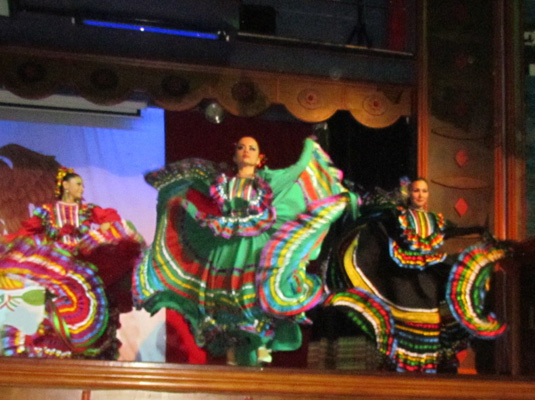 Here is a traditional folklorial dance performed throughout Mexico. 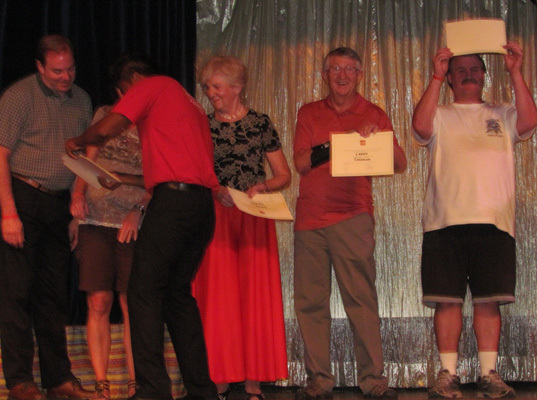 This was variety night, which included dances from different parts of the world. Very Good!! Slumber Night. 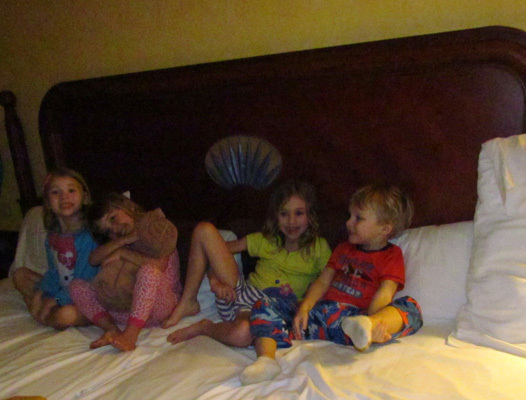 This is the first night that our grandkids slept away from their Moms and Dads and what a treat it was for us. Here they are getting ready for a movie. By the time it was over, three were already sleeping and when the lights went out, the other two went to sleep. We are glad to be a part of another first! This is a coincidence. 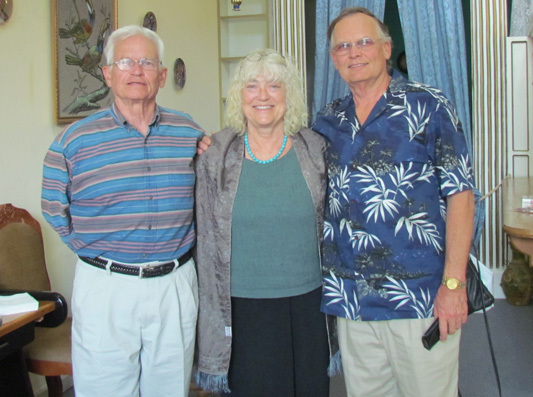 Larry's cousin Tom and his wife Maryanne let us know that they were at their time share a few miles down the road. Some of their kids and grandkids will be spending time with them also. We saw them last summer at their home in Gig Harbor, WA. Another great visit. 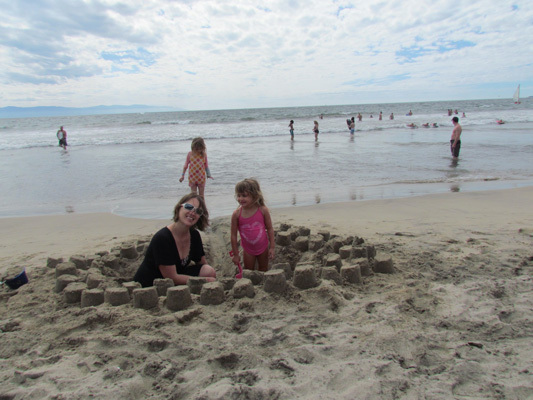 With California beaches nearby, Carmen and her family have lots more experience than the rest of us. Here Carmen and Sierra are digging their way to China and building a great fortress to protect them. However the tide came in and they had to abandon the project. Oh WOW!! 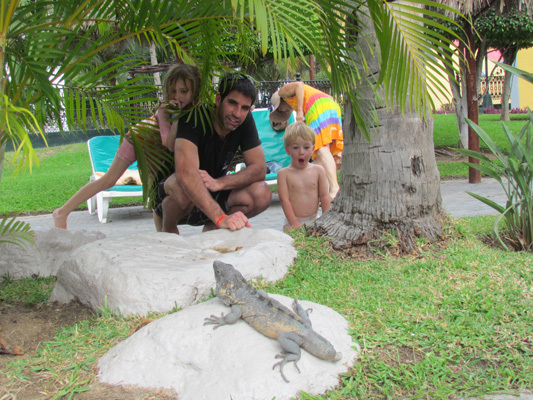 Look at Hunter taking in his first sighting of an Iguana. This poor animal lost its tail, but what a wonderful thing to experience. And the WINNER is Dakota Barnhardt, representing the United States of America. She, and two other girls from Canada and Mexico had to perform three different routines, and the applause reader gave the award to Dakota. Thankfully we had the front row. 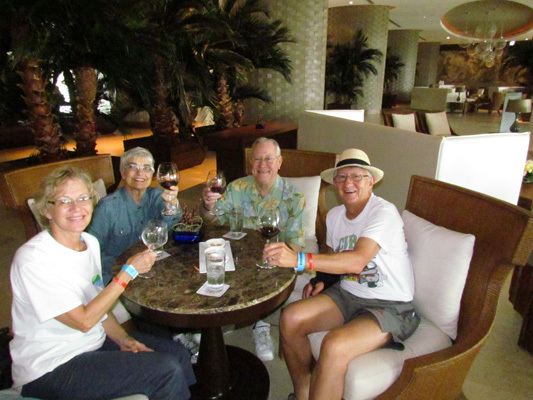 On our last day, we took Carmen and her family to the heart of Puerto Vallarta to experience the sights and sounds of this vibrant Mexican resort. 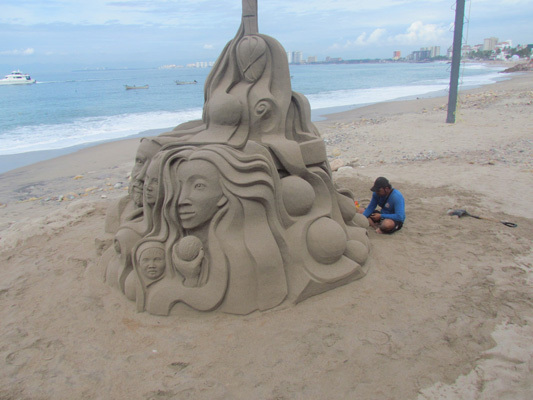 Here is an artist putting the final touches on this sand sculpture. 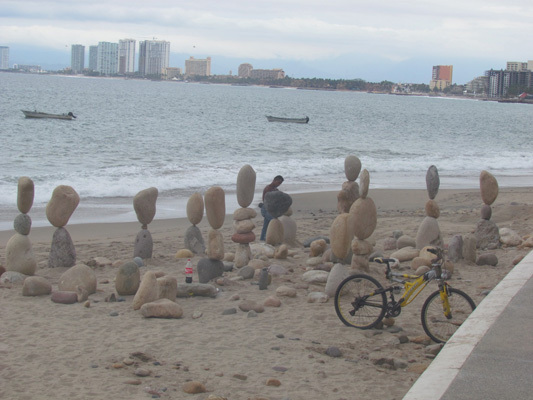 There were several sculptures lining the Malecon. 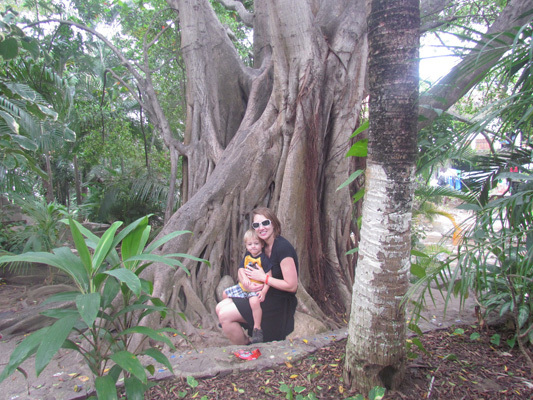 Here we are in old Vallarta with a river running in the background and Carmen and Hunter relaxing alongside of this massive rubber tree. This is one plant that Carmen does not have in her yard. Before leaving, we got a glimpse of this masterpiece. Stacked rocks--some stacked as many as six rocks tall. And these are not tiny rocks. This reminded Larry of one of his chores while growing up on a farm in the buttes of Western North Dakota. This craftsmen works for tips. At night, he knocks them all over and does it again the next day. Having said farewell to the kids, we drove back to Ajijic--in the rain. 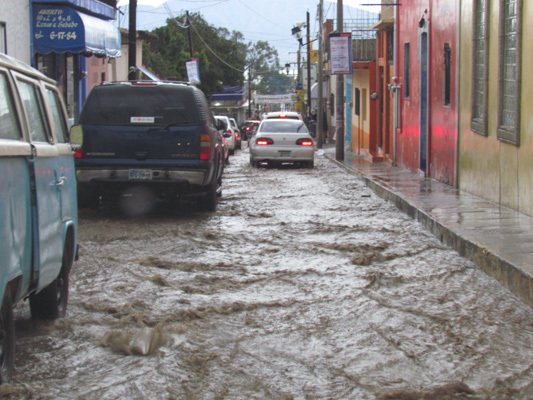 That evening we went into the village to attend a fundraiser and the streets looked more like rivers. To say the least, we were all soaked but the food, the comradely and the cause were worth it. The fundraiser was for a local charity called "Have Hammers Will Travel." The school is designed to teach kids life skills in the world of carpentry. 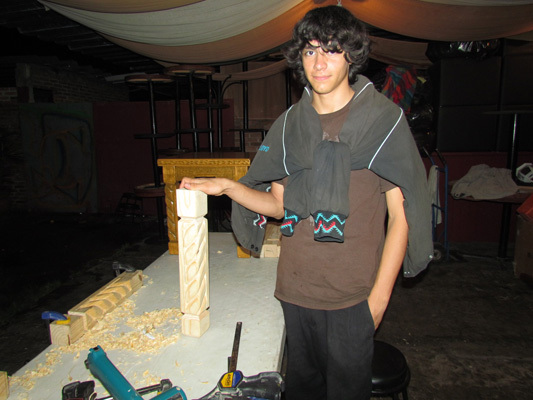 Here is one of the students displaying his work of art--a sculpted leg for an end table like the one in the background. Pride in workmanship is one of the life skills they want the students to learn. With Easter closing in and many preparing for Lent, Fat Tuesday was an opportunity for everyone to let their hair down. 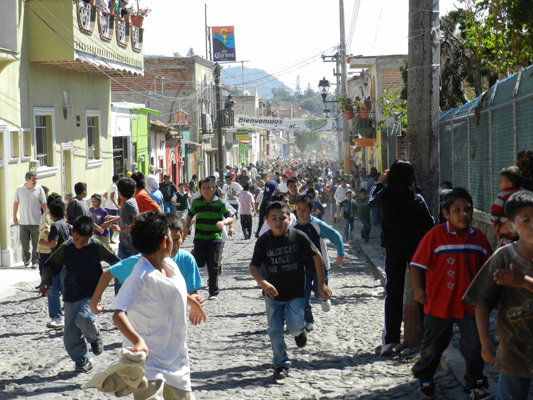 Here were a crowd of kids running down the street to avoid getting flour or confetti thrown in their faces. If you look close, you can see a cloud of flour and the street is covered with it. Here is one of many multicolored float in the parade. The dragon lady is really a man--many men dress as voluptuous women, some carrying bags of flour. Along with cowboys and delightful clowns the whole day was full of fun and mischief. Well we did not get spared. Poor Jerry (the picture taker) got slammed with flour in his eyes, ears and nose. Alistair, in the middle looks good compared to Jerry. 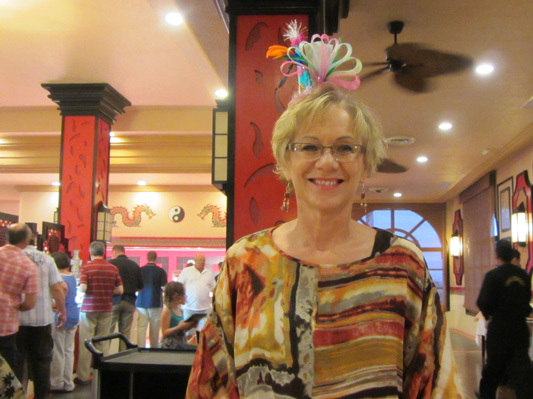 Here we added a little twist to our Friday night social with a party for those celebrating February birthdays. 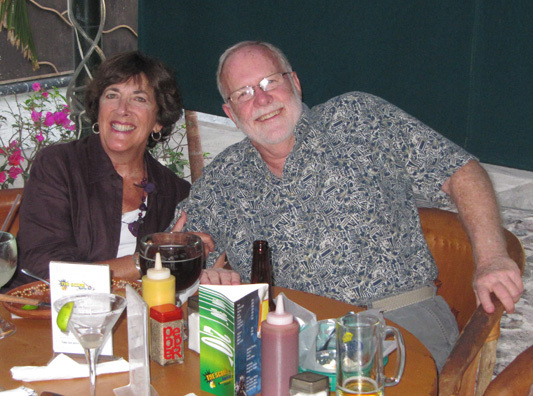 Here is one of our Minnesota friends Kay along with her friend Ron. Here is Jerry, who just turned 50...................plus change. He just got a spiffy hair do just for the occasion?!? Lastly, here is Larry with friends from BC. 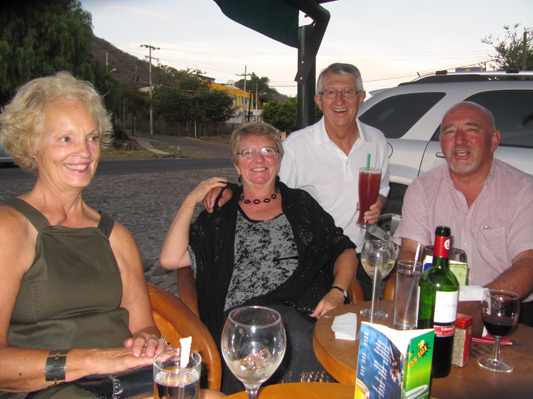 Carolyn, on the left, also turned 50.... She is with Ross and Carol, friends we met on our Zacatecas trip in November.